Offsidebet is a relatively new online sports bookmaker. The website was established back in 2008. Offsidebet is part of the Offside Gaming business. 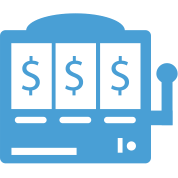 The latter provide gaming and sports betting technology and platforms to their clients. Some of the Offside Gaming users are Inkabet, LSbet, Hiperbet, Forverbet, and others. Offsidebet is registered, licensed and operates under the jurisdiction of Curacao. The owner of these businesses is the Media Entertainment N.V. company. The bookie used to be outside of the top 500000 most visited websites in the world, but during the three last months, it has climbed a lot and is now in the list. Most of the visitors are Portuguese, and Offsidebet is in the top 4000 most popular websites in Portugal. It seems the managers know how to make a betting site popular! 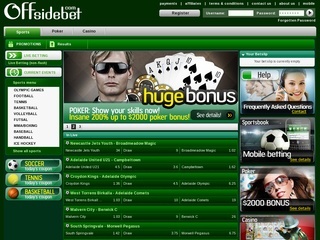 Offsidebet’s design is immaculate, with only a few shades of green and white used as the primary colors. However, the team names in the live menu can be a bit hurtful towards the eyes. Other than the color scheme, they have everything an online bookie needs – a sports list, live and upcoming events and a bet slip plus banners with offers. Offsidebet has recently released a mobile version of their website, expressly developed for all kinds of devices. I have to say the mobile platform is quite impressive and very easy to use for new and veteran players alike. On Offsidebet, punters can choose from a wide variety of sports – 21 to be precise. Football, tennis and cricket are some of the sports you can pick from. The good thing about Offsidebet’s live betting option is that it’s available both in Flash and in regular view. If your computer is a bit older, or if you simply don’t trust Flash, just click on the non-flash link on the main page. Another extra you don’t see everywhere are the Poker and e-Sports betting options. Players can bet on League of Legends, CS: GO and other favorite computer games. The casino games section on Offsidebet’s website is powered by Netent – one of the largest casino game providers on the web. With that said, players will inevitably find their favorite slots, table, poker or other games they’ve seen on other websites. Some of those games are The French Roulette, European Roulette, Dracula and Lost Island. The online bookie also offers Poker software, readily available for download. You simply have to register an account, download and install the client, register your nickname and finally, deposit some funds. All of these steps happen quickly, and the welcome first deposit bonus is larger than anything I’ve seen. 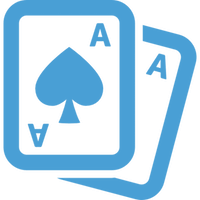 If you are only looking to improve your game, visit the poker school page on Offsidebet. But if you are after the tournament side of poker – there is a vast number of contests happening all the time. You will not be disappointed. Offsidebet offers very competitive odds, striving to be around the average numbers among the online bookmakers. If you open a game, you will see the classics – 1X2, total goals and handicap. Players, however, can make the most money out of correct score guesses and winning margin bets. The highest rates can go as high as 101 to one. The minimum bet is 0.5 USD, and the maximum varies between sports and games. The most you can win from a bet is 100000 USD. These features make Offsidebet great for small and medium rate punters. The website of Offsidebet is, of course, utilizing SSL encryption. Every site that handles money should be well protected from malicious attacks. Offsidebet is no exception. The business’ customer service is great but doesn’t offer a telephone number. The only way players can contact the employees and request answers or assistance are e-mail and live chat. The department is open to customers from 7:30 a.m. to 7 p.m. CET every day of the week. Offsidebet supports English, Greek, Portuguese, Romanian, Russian and Bulgarian languages. The deposit methods on Offsidebet are quite varied. Players can add funds to their accounts using credit/debit cards and other methods which are listed in the table. All of the options are commission free and support few currencies which can be found in the table. Only Ukash is limited to the Euro. Withdrawal of funds happens through the same channels and is also free of fees, which is a breath of fresh air. Offsidebet offers a variety of rewards to the customers. Sadly, none of them apply to the sportsbook. The largest offer you will get is the Poker first deposit bonus – 200% gifted up to 2000 USD. Aside from the welcome offer, there are constant daily promotions available for poker players. For example, you can get 500 USD for a Royal Flush, 100$ for Best Hand and 150$ Bad Beat bonus. The live tournaments are also considered special offers in some way. On the other hand, players can also receive various offers in the Live and regular Casino. You can get up to ten daily free spins. 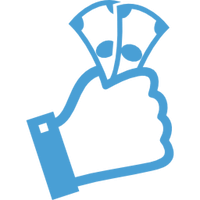 Players can collect loyalty points by only playing and then they can convert the said points into money or tournament tickets. Overall the promotions are great, and you should check them out.